Cybertonature Cottage is a modern garden cottage with top security, situated in the shadow of the Magaliesberge in the tranquil suburb of Wonderboom, Pretoria. One bedroom, dining room/study, lounge, huge bathroom. Wireless Internet, satelite TV, and swimming pool. Ideal for short-term visits by businessmen, couples, small families, backpackers, students and other visitors to Pretoria, single or couple. On bus routes to city centre. Self-catering. Near Wonderboom International Airport, several malls with lots of entertainment. Special weekly and monthly rates. WHAT IS ON IN THE CITY IF YOU ARE NOT WATCHING FOOTBALL? Games drives, history tours or just enjoying the night life! Administrative Capital of South Africa and home to over 175 foreign representatives. 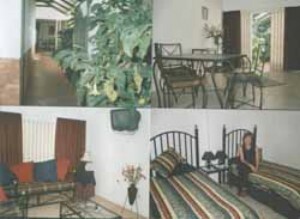 Situated 1363 m above sea level with a warm well watered climate. 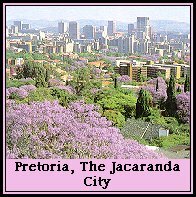 Well known for it's 60 000 Jacaranda trees ( full bloom in October / November ), the architecture of the Union Buildings and the Voortrekker Monument. Rich in history, art and nightlife Pretoria has something to offer every visitor. With a wide variety of accommodation on offer, Pretoria will make you feel right at home. Pretoria is the ideal base to start your African adventure !